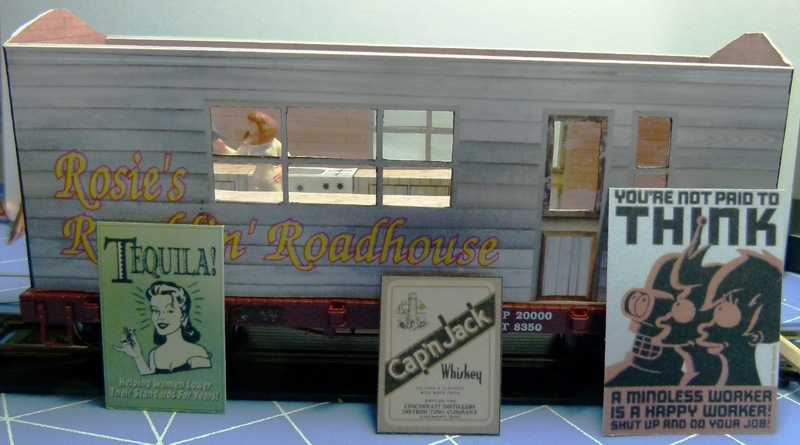 I spent most of the afternoon working on my cardstock model of Rosie’s Ramblin’ Roadhouse. Here’s a picture of the 2nd generation build. That’s not Rosie getting something from the fridge. That’s a friend who helps out once in a while. A local sign painter agreed to give the Roadhouse a fresh coat of paint if he could display some of his projects. Methinks I will have to generate at least one more model before I get it to look good enough. If there’s enough interest, I might offer it as a kit.